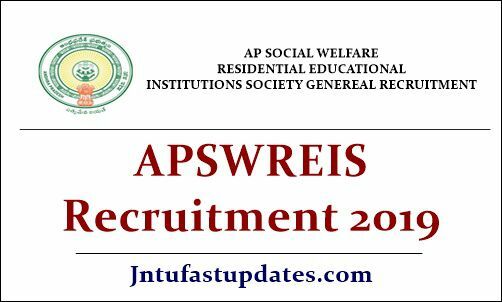 APSWREIS Recruitment 2019: AP Social Welfare Residential Educational Institutions Society (APSWREIS) has announced Genereal Recruitment for 750 Posts. Eligible Candiates can apply online for appointment of DCO / Principal Grade-II / Trained Graduate Teacher / Caretaker(Warden) through direct recruitment in the Institutions run by APSWREI society in the State. Applicants must have completed Bachelor Degree/ Master Degree/ B.Ed. from recognized university. Check the Advertisement for educational qualification. APSWREIS selection will be Purely based on Written test/ English language proficiency (ELP) test. The Applicants have to pay a fee of Rs.500/- towards Application processing fee for each post through Debit Card / Credit Card / On-line Transfer. On receipt of fee, the candidate shall be issued a Unique ID, which will act as reference number for the application. It may be noted that issuance of Unique ID does not mean that the candidate has submitted the application on-line. It is only a confirmation of the fee received. No person shall be eligible for direct recruitment to the above posts, if he / she is less than 18 years of age or more than 44 years of age as on 1.1.2019. 2. Only on payment of fee on-line, an applicant can continue with filling up the application form. 3. Single application will be filled up by candidate, even if he /she is applying for more than one post. However the candidate has to pay fee @ Rs.500/- per each post. 4. No need to enclose any Certificates at the time of submitting on-line application. 6. Candidates who submit false/fake information in online application form shall be liable for criminal prosecution besides rejection of the application or cancellation of selection, as the case may be. Sir nenu already 10 years nundi apswries lo contract teacher ga chestunanu.,kani na experience application lo enter avvaledu.edit option istara. sir iam completed inter aposs 2012 and Hindi vidwan completed 2004 online application not accepted and iam also completed hindi bhushan this is equalent to inter .how can i apply sir. please.give suggestion.